Reliance Jio Infocomm is in talks with US contract manufacturer Flex for locally producing about 100 million mobile phone handsets as the Mukesh Ambani-owned telco seeks to rapidly enhance its market share by signing on the majority of those users now using feature phones. “Jio is in advanced discussions for a large order and that has caused a stir in the market, even prompting Flex to negotiate some tax benefits with the government in the SEZ where its factory is located,” a person familiar with matter told ET. Both Flex and Jio didn’t respond to ET’s emailed queries. 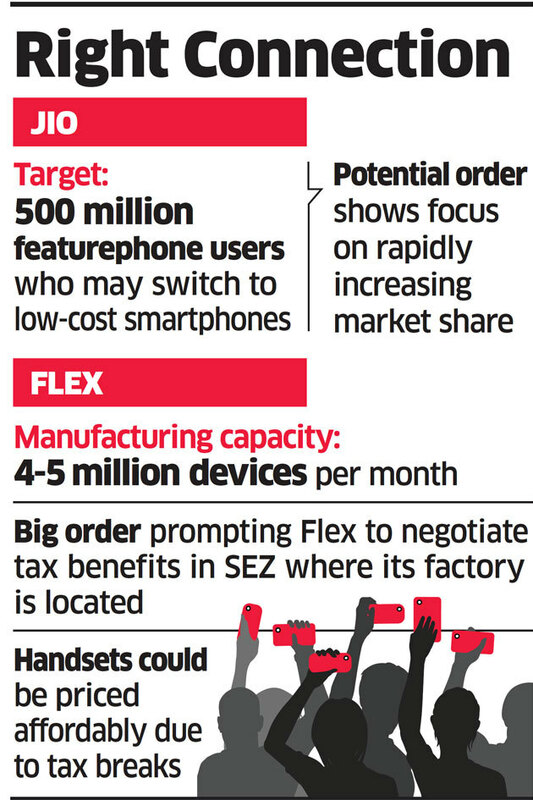 Another person said that Flex currently has the capacity to manufacture around 4-5 million devices per month at its factory in the special economic zone (SEZ) near Chennai. “However, the company wants to be able to sell the produced units in the domestic tariff area (DTAs), without attracting the duties, at rates similar to that of FTAs,” the person said. Any move by the government to allow selling goods produced in the SEZ in DTAs without attracting duties would allow the handsets to be priced affordably, making it attractive for the first-time smartphone buyers, said experts. It is only natural that Jio is targeting the next low-hanging fruit, the bulk of India’s 500 million featurephone users who would switch to smartphones if the bundled price points for the service and handsets were attractive. Jio’s objective of rapidly gaining market share is clear from the size of the imminent order. Data from Counterpoint Research showed that 118 million and 134 million smartphones were sold in 2016 and 2017, respectively, in India. The agency expects the number to be around 150 million in 2018. An ICICI Securities report on the telecom regulator’s data showed that Vodafone Idea was leading the pack, with a revenue market share of 32.8%, followed by Bharti Airtel at 30.9%, and Reliance Jio at 26.1%. But Jio was making rapid gains, compared with losses of its rivals, due to largely expanding market share in the rural areas and tier-3 towns after the launch of its 4G VoLTE featurephone — JioPhone. Jio’s recent Monsoon Hungama offer of exchanging any old featurephone for a JioPhone for around Rs 1,000 (including six months recharge) has also proven to be a hit, with users of plainvanilla phones upgrading to 4G and contributing to the upsurge in Jio’s subscriber base at over 252 million by end-September. By contrast, Vodafone India and Bharti Airtel reported declines. A report by research firm Bernstien said that Jio’s phone subsidy model could help it lead the market in the future, especially if its rivals failed to match up. “If left unchallenged, we believe Jio could reach the leading revenue market share by 2021 and by subscribers by 2022. We now expect Jio to reach 28% revenue market share and 26% subscriber market share by the end of this financial year,” the report said. Navkender Singh, associate research director at market tracker IDC, said Jio is currently in a sweet spot, and could target the top end of featurephone users to convert them into the Rs 2,000-Rs 2,500 smartphone-user segment. “With its deep pockets, Jio is the best placed to seize the opportunity to upgrade at least the top 60% of the featurephone users,” Singh said, cautioning that the telco must bundle attractive plans. “To pull this off successfully, Jio will have to take care of the maintenance of the phone along with, may be, 1GB of data a day,” Singh said. He explained that one of the concerns deterring featurephone users from switching was the scare of easily broken screens, which could cost up to half of a new smartphone. “There is no point in buying a phone at Rs 2,000 if a broken screen would require a Rs 1,000 charge. So, Jio will have to absorb this cost if it wants customers to buy in,” Singh said.